This was probably the coolest outing ever, with barely a bead of sweat to stain my brow and consequently no need to shower later. As usual I had taxi troubles; a twenty minute wait preceded a ride with a driver with a maximum speed was 80 km/h, an itchy brakefoot and unseemly affinity for the leftmost lane. From the pier, the morning was cloudy, even chilly. Dark expanses of vapour hung over the harbour, threatening a deluge of hot air. The sun emerged draped in a dreary cloak of clouds, gold and gaunt. Its sliver of shine hits the city of grey and glass, throwing a gauze of pale radiance over cold and steely towers. The boat is a fast one and the team is (relatively) light, with no bulky recording gear. With us was Dr. Daphne Fautin from the Natural History Museum of Kansas University, probably the world's foremost authority on sea anemones and other hexacorallians. Accompanying Dr. Fautin was Dr. Tan Swee Hee of the RMBR and two unfortunate undergraduate minions tasked with ferrying the team's collecting gear and specimens. The rest of us were there for the ride and the chance to muck around in the mud of Pulau Hantu. The phylum Cnidaria is characterised (among other things) by radially symmetrical creatures with two versatile body forms: the polyp and the medusa. Jellyfish (a generic term that lumps together several orders over three classes) are in effect polyps that have become free-swimming. Unfortunate swimmers who blunder into jellies would be familiar with the stinging nematocysts (or cnida) that inject toxins via a barbed tip at the end of a harpoon-like hypodermic tube. Contact with hydroids, man-o'war jellies, fire coral and other members of the Class Hydrozoa hurts the most, while other cnidarians, from anemones to corals and sea fans offer varying degrees of pain to the skin of naked ducks. 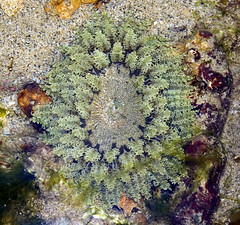 Hexacorallians form a division in the Class Anthozoa that includes true sea anemones (Actiniaria), tube or peacock anemones (Ceriantharia), reef-building hard corals, corallimorphs, zooanthids (right) and black or thorny corals. Non-hexacorallian Anthozoans include the sea pens, gorgonians and soft corals. The name hails from the arrangement of their mesenteries (vertical body partitions) in multiples of sixes. Dr. Fautin's stopover in Singapore entails a number of field and collection trips in search of sea anemones from various habitats. Fruitful shores include the muddy flats and seagrasses of Changi, where she shared the confusion sown amongst scientists worldwide by hitchhiking little anemones that travel the world in bows of ballast. 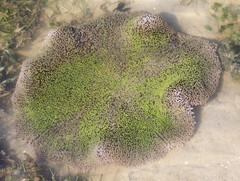 There, the identity of a small carpet anemone thought to be juveniles of a larger species was clarified. Meanwhile, the animals squirmed, squirted and even swam in protest at this unwanted attention that involved unceremonious digs into the mud to capture creatures with no name. At Chek Jawa, more unknowns were found amidst the regular crowd of banded anemones and Stichodactyla haddoni carpet anemones (left). 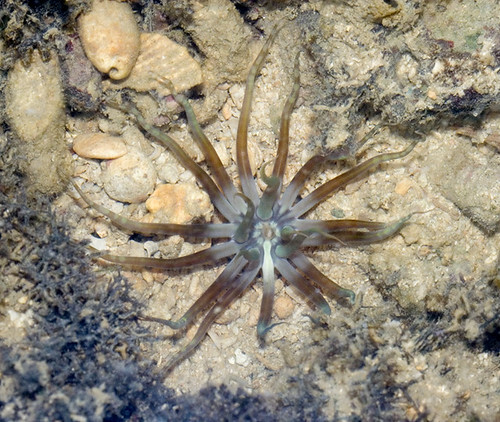 Pulau Hantu was a key location, as one anemone species, Edwardsia hantuensis, was described from a specimen found at the island. The island's rim and lagoon offers a muddy lagoon where Dr. Fautin sought out burrowing species and a reefy fringe with rocks and coral rubble that provide homes to large Merten's carpet anemones. 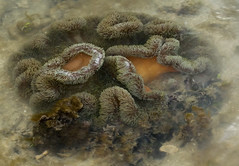 Spanning over a metre in diameter, carpet anemones such as Stichodactyla mertensii can live for over a century and shelter generations of clownfish and shrimp, if they escape the hands of collectors who think naught of the animals' poor survivability in captivity and low rates of natural recruitment. Favouring cozy nooks in the rubble are frilly tentacles anemones in the genus Phymanthus. 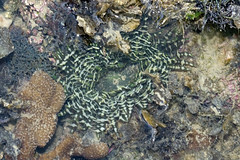 The light green type pictured above is the most common, but there are others that appear to have pale bands on the tentacles and other patterns or textures. It's unclear if the animals are varieties of the same species, or more likely, different but allied taxa. 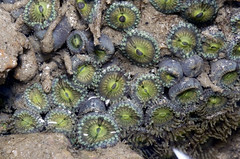 According to Dr. Fautin, little is known about the natural history of these anemones. They are also hard to grasp physically, as their bodies beneath the ring of tentacles extends deep into crevices, eluding the efforts of long arms and firm hands. 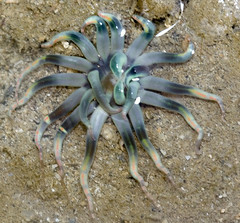 These colourful anemones with sparse, straggly tentacles were thought to be Condylactis species. However, Dr. Fautin has suggested that these are quite a different kettle of fish. Such inconvenient truths are troublesome facts for these parts, where the great and the greedy must weigh between the choice of taming wild shores to build bungalows that face barren waters and the call to preserve habitats that provide invaluable ecosystems services as well as untold volumes of discovery even for global experts. Proteins from sea anemones have been used to develop molecular photoswitches, but it's probably a long stretch to hope that the technological promises of such arcane undertakings will trump the might of a fast buck. 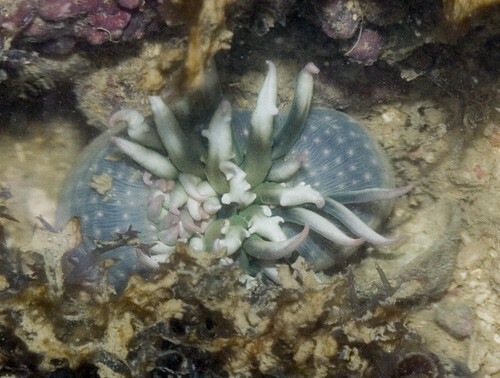 Another curiosity near the reef slope is this anemone with a bulbous body and stubby tentacles. I can't recall what Dr. Fautin said about this species, and the details will have to wait til a workshop this weekend. But other tidbits on anemone ecology from today's outing gave tantalising glimpses into the strange world of this flower-like feeders. 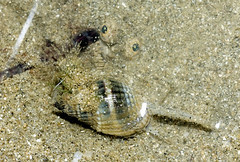 Some sea anemones attach themselves to shells inhabited by hermit crabs, and when the anomurans upgrade to larger homes, they actually detach the anemones and 'replant' them on the new shell. 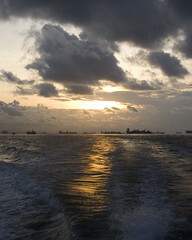 Back on Hantu, Edwardsia remained elusive and the thunder from a service vessel across the water on Bukom drowned out the rumble of celestial shockwaves. The rain fell flightily, and we returned to the marina in the shadow of refueling tankers and 12-storey high container carriers that glide with bursts that belie their bulk.